What do sales excellence and competing in mountain marathons have in common? In May 2012 we’ll find out! 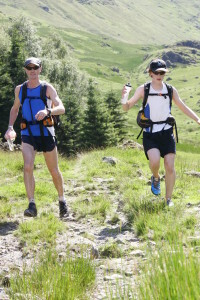 Selling Interactions is sponsoring a Father & Son attempt in the Great Lakeland 3 Day Race (GL3D) a gruelling foot race involving 3 consecutive marathons in the Lake District (78 miles off road in total, with substantial vertical ascent). Just like a good sales strategy, preparation for this type of event involves planning, preparation and consistent discipline to make it possible. Anderson and his son Alastair have been in training since December, with a mix of running, weights, mountain biking and hill training to prepare themselves for the event. They are on track to “do the distance”, but you never know what’s around the corner!! Any good sales programme “unfolds” over time, as the base work is done and then translates into improved results for customer revenues. In this way, we see a lot of parallels between long distance foot races and sales excellence. Wish them luck!